The Commission and Board of Real Estate Service announced the full list of passers and the top 10 examinees of the Real Estate Broker Licensure Examination given in Manila, Baguio, Cagayan de Oro, Cebu, Davao, Iloilo, Legazpi, Lucena and Tuguegarao this May 2015. The results were released in four (4) working days after the said examination, PRC said. The members of the Board of Real Estate Service are the following; Dr. Eduardo G. Ong, Chairman; Florencio C. Diño II and Rafael M. Fajardo, Members. PRC advised all successful examinees to observe the right steps for filling of oath registration. Real Estate Broker Passers are also advised to strictly observe the schedule for initial registration to avoid any inconvenience. 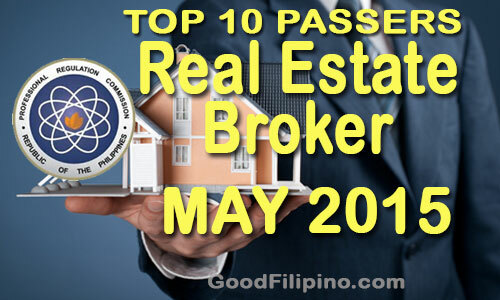 Comments or suggestions about "May 2015 Top 10 Real Estate Broker Board Exam Passers" is important to us, you may share it by using the comment box below.